Signalling its intention to offer audio solutions for all room sizes and applications, Genelec has announced the global launch of two new high- SPL SAM monitors: the two-way S360 and the 7382 subwoofer. Both models are ideal for any professional application that demands high acoustic power or listening at a distance – from large immersive setups in post-production studios or film mixing stages to play-live monitoring in music production or EDM playback. Housed in a compact, low diffraction enclosure with premium quality Finnish woodwork, the S360 features a further enhanced 10-inch high efficiency and minimal distortion woofer based on Genelec’s Master Series, and a completely integrated extended directivity control waveguide DCWTM, supporting its 1.7-inch titanium diaphragm compression tweeter. The result combines the neutrality for which Genelec is known, with a short-term SPL capability of 118 dB – with peaks even higher – and a long throw capability that can provide reference quality accuracy even at listening distances of over 10 metres (33 feet). The S360 offers the benefits of main monitor performance in a condensed form factor, including excellent on-axis characteristics and uncoloured 95-degree (h) to 75-degree (v) dispersion. The S360 enclosure offers versatile in-wall and on-wall mounting options, while down- firing, flow optimized laminar integrated reflex ports (LIPTM) ensure tight and noise-free bass output and are also perfectly suited for use with perforated screens. Alternatively, when the S360 is used in free-standing mode the innovative Iso-Plate effectively decouples the monitor from its base, focusing low frequency output while preventing vibration transfer and air turbulence. Further flexibility comes courtesy of the system electronics, which can be either integrated into the enclosure or positioned remotely. 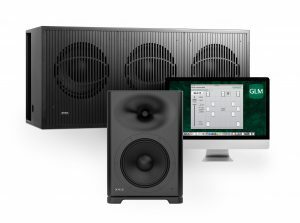 Knowing that the production of good content depends on monitors being correctly positioned, level-aligned, time-aligned and room-compensated, the S360 offers full integration with Genelec’s GLMTM software, allowing the configuration, calibration and monitor control of more than 40 channels without the need for external processing. The ideal companion for both the S360and Genelec’s other large format monitors is the 7382 – Genelec’s most powerful subwoofer to date. Delivering precise, powerful low frequency extension down to 15Hz, the 7382 houses three custom-designed 15-inch-long throw woofers. Each benefits from the vibration-free environment of a heavily braced fibreboard enclosure, with laminar flow bass reflex porting extending along the entire rear wall to ensure low distortion and compression-free performance, even when the 7382 delivers outputs in excess of 130 dB SPL. Drawing on integrated processing and decades of research, the 7382 also works with GLM software to control bass management, solve issues of subwoofer placement in unpredictable rooms, or even to build entire arrays of Genelec subwoofers. The arrival of the S360 and 7382 coincides with the publication of a new set of educational tools aimed at helping professionals to better understand and make use of Immersive Audio. Titled Genelec Immersive Solutions, the publication will include a comprehensive overview of the requirements for creating an effective immersive audio set-up, including insights into the most commonly adopted formats and the Genelec solutions required to make the most of them. Due to launch alongside the S360 and 7382, the publication will also be available for download from www.genelec.com/immersive.